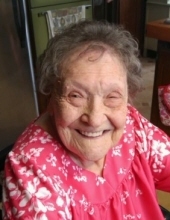 Genevieve Louise Bloom, 93, passed away Saturday March 30, 2019 at her residence after a lengthy illness. Born June 23, 1925 in Chase, Clearfield County, she was the daughter of Freidlof Gustoff and Clara (Curry) Malmburg. Mrs. Bloom was a homemaker and had also worked for the former Packard Electric and Airplane/Marine. She had been a member of the L.O.O.M. and the Fraternal Order of Eagles. She had wed Frederick J. Bloom Sr. in 1943 and who preceded her in death in 2004. She was also preceded in death by her parents, a son Frederick J. Bloom Jr. and a sister Joanne Danvir. Surviving are three children: Carol Ann Smith and husband Gary of Warren, OH, Benjamin L. Bloom and Thomas C. Bloom and his significant other Thersa Martin; five grandchildren Barbara Bloom, Joseph Bloom and Jason Bloom, Frederick Bloom III and Terri Loomis; a brother and three sisters: Howard Malmburg, Betty Rowles and husband Arnie and Shirley Leiebal all of Warren, OH and Alice Price of Curwensville. Family and friends will be received at the Chester C. Chidboy Funeral Home, Inc. of Curwensville on Tuesday April 2, 2019 from 3:00 to 7:00 PM. Family graveside services at Oak Hill Cemetery in Curwensville, will be held at a later date. To plant a tree in memory of Genevieve Louise Bloom, please visit our Tribute Store. "Email Address" would like to share the life celebration of Genevieve Louise Bloom. Click on the "link" to go to share a favorite memory or leave a condolence message for the family.